Discussion of the Lorwyn-Shadowmoor block too often comes down to “It wasn’t well-received on average” and “The weirdness is off-putting or something”. First of all, by and to whom – and second of all, there are good reasons for it to be more prominent in our assessment of Magic’s history. Lorwyn saw the introduction of the planeswalker card type, which I hear is important to competitive play. Shadowmoor brought an in-depth exploration of the uses of hybrid mana, and designs related to mono-colored cards which were evolved by the Theros block. And the entire thing was steeped in weird corners of Celtic folklore and faerie tales gone wrong – do we really want fantasy settings to be unique, or to become people striking the same poses in the context of the meme of the year? And what does Creakwood Liege contribute that’s worthwhile? It has a slightly restrictive mana cost which can be hard to meet outside of mono-green, mono-black, and green-black, but all of those combinations are quite good at producing tokens and otherwise flooding the table with creatures to benefit from his ability. We also shouldn’t underestimate the potential of an “unofficial” extra lord for tribes like Squirrels, Thrulls, and others that sometimes lack that little extra support that the more common tribes take for granted. In Shadowmoor there were 5 Ally Knight lieges. Then in Eventide there were 5 enemy Horror lieges. While the former followed a strict pattern, the later had more diversity. While some were bad, (read Mindwrack Liege) today’s card is probably the best of the 10. Being able to give all Golgari creatures +2/+2 is pretty nice. This includes those puny 1/1 worms you get every turn. Free creatures every turn, no matter the stats, is good. A constant supply of chumps can effectively shut down a single beat stick. But this is Golgari we’re talking about. These worms are best used as sacrifices. Savra, Jarad, and Doomgape rejoice. 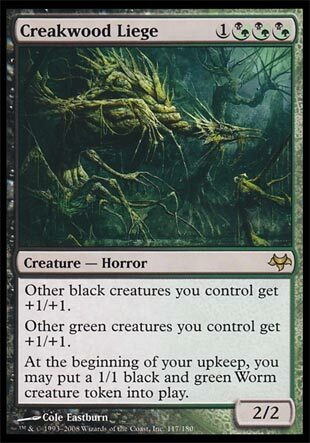 There’s a good reason Creakwood is the most reprinted Liege. By itself it can flood the board with 3/3s but in the right deck it can enable combo shenanigans. This makes Creakwood Liege a powerful double threat. Part of the Shadowmoor block 10-card Liege megacycle, the black and green one is…okay. You’re effectively making a 3/3 on each of your turns, but it’s appended to a 2/2 with no protection whatsoever. Creakwood Liege can snowball a game nicely, but a fragile body does it no favors, so don’t get any ideas about playing it outside of Commander or more casual formats.